Several gunshots were fired early Monday morning from a vehicle at the US Embassy in the Turkish capital, Ankara, causing no casualties, police and the embassy spokesperson said. The attack coincided with a deepening row between Ankara and Washington over the trial of a US pastor in Turkey. A police officer told Reuters at the scene the drive-by shooting occurred around 5am (0200 GMT) and that nobody was hurt. The embassy is closed this week for a public holiday to mark the Islamic Eidul-Azha festival. Police teams were searching for the assailants, who fled in a white car after the attack, CNN Turk said. Four or five gunshots were heard, it said, one hitting a window in a security cabin but causing no casualties. 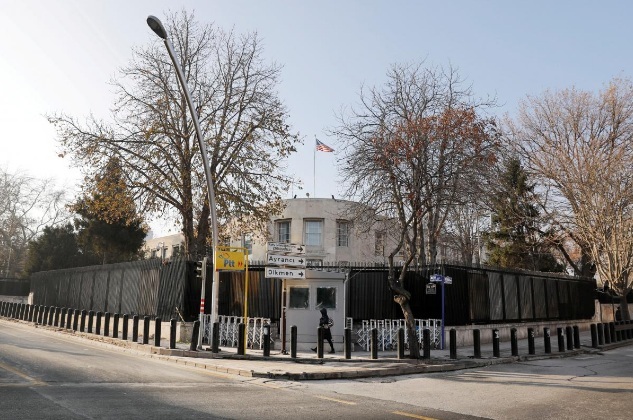 The US Embassy in Ankara and the consulate in Istanbul have been the targets of attacks by militants and have faced numerous security threats in the past.